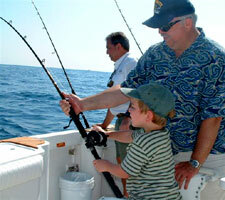 Aboard Fishing is not one of the usual fishing web sites that for a fee any captain or fishing guide can join. We only sanction a select few charter captains and charter operations to participate in our web site. All participants in the Aboard Fishing Fleet must meet our stringent criteria that includes the professionalism of the captains and crew, utilization of quality fishing tackle, a clean and well maintained boat, affordable charter rates, extensive fishing experience and their commitment to make your day of fishing a quality fishing experience. Aboard Fishing is your foremost resource to locate top quality, professional fishing charters, fishing guides, and fishing captains along Florida’s east coast. If you are considering a fishing trip on Florida’s east coast from Daytona Beach to Miami then you should consider fishing with the Aboard Fishing Fleet headquartered in Stuart, Florida. Fishing with one of our full time, experienced, professional charter captains assures the best possible fishing experience. Our member captains have extensive experience and do an exceptional job of catching sailfish, marlin, swordfish, dolphin (mahi-mahi), wahoo, cobia, yellowfin tuna, king and spanish mackerel, jack crevalle, snook, tarpon plus a variety of other species. Our captains specialize in light tackle fishing - matching the tackle to what you are catching. These charters are for both the experienced and the novice fisherman. If catching fish and having a quality fishing experience are your objectives then the Aboard Fishing Fleet is the right choice. In the waters around Stuart, Florida excellent year round fishing opportunities abound. Stuart is known as "The Sailfish Capital of the World," and is rated as one of the best sailfishing spots in the world during December, January, and February. 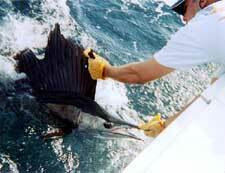 Catching multiple Sailfish in a day is not unusual. In addition to the peak sailfish season there is a resident population of sailfish that remains in the area year round, which means catching a sailfish is always a good possibility. One of the many advantages of fishing in Stuart is that the Gulfstream and deep water is close to shore, translating to more time fishing, not riding. Stuart is an easy drive from anywhere in Central or South Florida (no more than a couple of hours) making fishing here very convenient for anyone who is visiting or who lives in the Central or South Florida area.